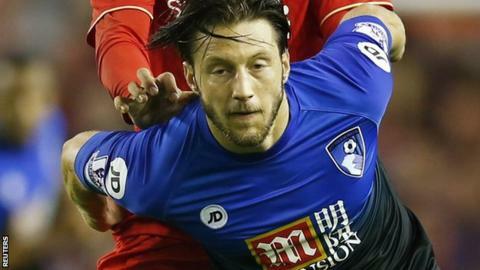 Bournemouth midfielder Harry Arter was thrilled to return to action in the League Cup loss at Liverpool after five months out with an ankle injury. Republic of Ireland international Arter, 25, made his first start of the season at Anfield, playing 70 minutes. But he could not prevent the Cherries losing 1-0 to Jurgen Klopp's side. "You appreciate playing football so much when you're injured. You take it for granted when you're playing regularly," he told BBC Radio Solent. Arter, who scored nine goals in 47 appearances for Bournemouth last season, admitted it was a relief to come through the fourth-round tie unscathed. "When my number came up on the substitutes' board, I was quite happy to come off," he added. "I'd hit the point where I felt I'd probably done enough. The gaffer realised that and took me off. "It was unbelievable to be back out there on an unbelievable ground and against a fantastic team. "As much as it was always going to be a difficult game, it was a nice one to come back into. The last five months have been really frustrating, but it makes you appreciate it."